This is a central location for readers at the various sites to enter to win copies of the book. Just leave your name and email contact information. On February 24 I'll pick two winners to receive an ebook copy of Collusion, and an additional winner will receive signed copies of both Diversion and Collusion, once the print book becomes available. As each post goes online, I'll provide links to the articles. Good luck! This contest is open only for those over eighteen who can legally possess such material in their area. I'm so excited about this release! I loved Diversion, and I have no doubt I'll love the sequel just as much. :D Good luck with your blog tour, and with the upcoming release! I'd love a chance to win one of your books. 8-) I'm Heather and you can contact me at reka[dot]stormborn[at]gmail[dot]com. Found the contest through your guest spot on Elisa Rolle's Reviews and Ramblings Blog. I loved hearing how your charaters are created...it makes them more real somehow. I looks forwarded to seeing what happens. Collusion is already on my TBR list. Thanks so much for the giveaway! Looking forward to reading this. You havent written a book I havent loved yet! DIVERSION is one of my all-time favorites, and I've been waiting for this one--thanks so much! Please count me too! Thanks for the contest. 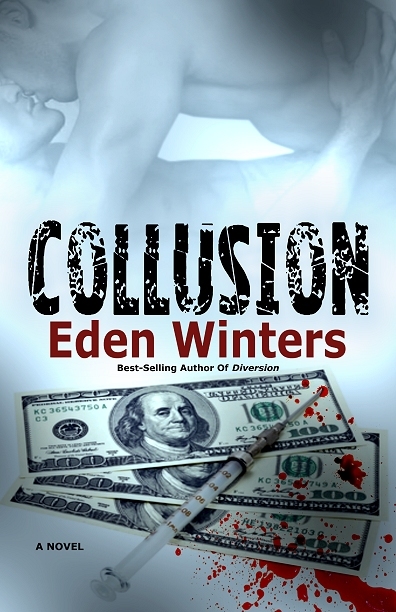 I loved Diversion and can't wait to read Collusion! Happy to hear there will be more stories, too. Thanks for the giveaway! Diversion was one of my favorite books last year. So many layers and histories to figure out! I loved Diversion so much and was not expecting there to be MORE!!!!!!!!!!!!!! I think it is awesome that you are even having this contest. Congrats on the upcoming release! I'd love to be entered, thank you! I just finished reading Diversion and loved it! I'm glad that there's another book coming out. I read - and LOVED - Diversion after your reading last October at GRL. I'm THRILLED to see the sequel! Woot! So happy to see that Bo and Lucky are coming back. Thanks for the opportunity to win a copy. I loved Diversion and would love a copy of Collusion. Count me in. Congrats on your upcoming release! I haven't read Diversion yet, but it's on my TBR. I'd love to read these. Thank you' and congratulations! Hello please count me in, I haven't read Diversion yet... Thank you. Thanks for the well wishes, everyone! It's finally release day, the contest is closed, and I'm about to pick some winners. Don't worry, if your name isn't called, the blog hop isn't over and I'll be posting another contest in a few days. Thanks so much for stopping by, and good luck! And winners of the ebook copies are: Yvette and Bookwym369. The winner of the signed print copies of both books is: Kaytee! I'll be emailing you shortly. Thanks everyone for entering and participating in the blog hop. Remember, I'll post another contest in a few days. Kaytee, you didn't leave contact information. Could you please contact me at edenwinters@gmail.com? Since I didn't win, I just went and ordered it already! Can't wait to start reading, even though I should be sleeping! I do hope you enjoy the book, boomonday! Hugs!